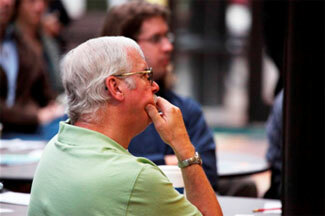 On October 21, more than 70 people gathered at the F.O.C.U.S. (Forging Our Community’s United Strength) Greater Syracuse community meeting to discuss improvements to Onondaga Lake, the community’s vision for the future of the southwest lakeshore, and substantial progress made to date on the lake cleanup, which has provided jobs for more than 500 Central New Yorkers. Bob Haley, of Syracuse (left), and community members provide recommendations on the preliminary plans for the southwest lakeshore. Chuckie Holstein, F.O.C.U.S. Greater Syracuse Executive Director, talks about how public/private collaboration is helping create a vision for the southwest lakeshore, as Matthew J. Millea, Onondaga County Deputy County Executive for Physical Services, looks on. During the meeting, McAuliffe gave updates on the lake remediation progress including the construction of a double-walled pipeline that will transport material removed from the lake, the water treatment system, and the containment area. 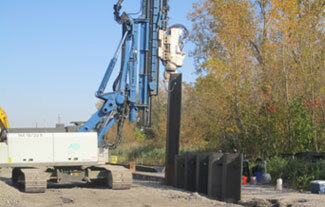 Completion is expected later this fall on the steel work for the third and final phase of the underground barrier wall – a major milestone in the cleanup that will cut off the primary source of groundwater contamination to Onondaga Lake. Steel panels being installed for third and final phase of the underground barrier wall. Prior to the meeting, more than 60 community members, municipal representatives, and local planners provided initial recommendations and suggestions about their vision for the southwest lakeshore through a series of small group meetings. At the F.O.C.U.S. meeting, community members had the opportunity to discuss the initial input, which was incorporated into a preliminary rendering of the lakeshore. 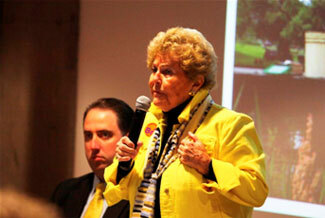 Suggestions prior to and at the meeting included: increasing public lake access and recreational opportunities, planning for connections to an expanded trail system, enhancing scenic views, providing options for mixed-use development, and more. 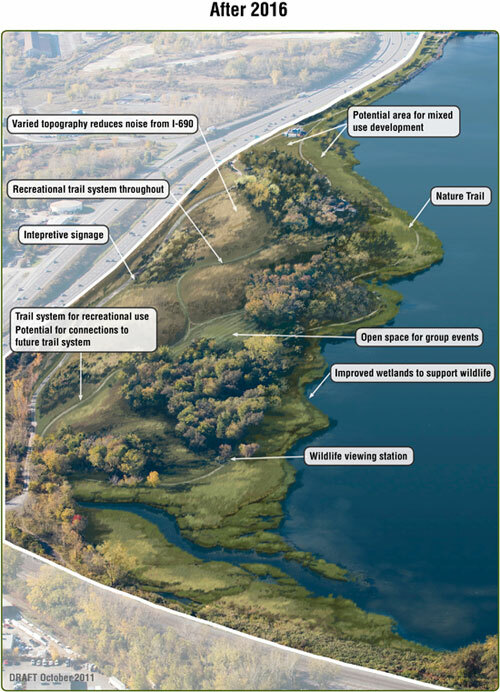 Honeywell will continue to engage groups in specific areas of the southwest lakeshore visioning project such as selecting plants to enhance habitat for wildlife and increasing recreational opportunities. Conceptual rendering of Onondaga Lake’s southwest lakeshore based on initial community input. Additional input will be incorporated over the next several years. Jack Ramsden, member of the Onondaga Lake Community Participation Working Group, listens during a discussion on the future vision of the southwest lakeshore. During the meeting, McAuliffe also provided an update on the water quality in Onondaga Lake. Based on the impressive work Onondaga County has completed to improve the water quality, the lake is the best it has been in decades and the amount of vegetation and the quantity of fish species found in the lake have both increased significantly. Currently, there are more than 500 Central New York scientists, engineers, and skilled craft laborers working with Honeywell to achieve substantial progress on the remediation as well as the re-establishment of habitat in and adjacent to the lake and surrounding upland sites. About 300 of the workers have been added to the team in the past year and Honeywell plans to hire more Central New York workers as the project continues. Work will continue along the southwest lakeshore throughout the next several years as part of the cleanup of Onondaga Lake. The wetlands along the southwest shoreline are included in the draft Onondaga Lake Habitat Restoration Plan. Final decisions about the cleanup for the land adjacent to I-690 along the southwest shoreline will be made by the New York State Department of Environmental Conservation in conjunction with the U.S. Environmental Protection Agency and the New York State Department of Health. If you are interested in participating or would like more information, please contact Honeywell at 315-552-9784. To view the full F.O.C.U.S. Greater Syracuse presentation, click here.